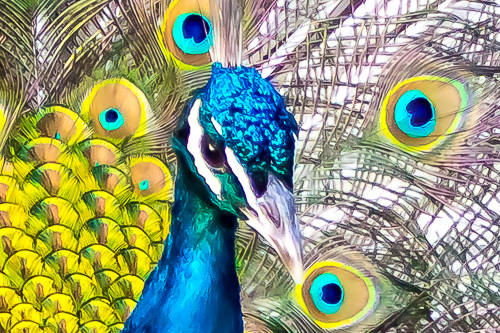 Instead of pigeons, what if they were “Peacocks from Hell”? It all started last week when in the extreme early morning (that darn golden hour), I was in the parking lot of the Glendale Library awaiting the arrival of a family that I was photographing that morning. The place sounded like “Wild Kingdom”. Apparently, a few of the peacocks from neighboring Sahuaro Ranch Park decided to wander over and check out the surroundings at the library, or do whatever peacocks do at 6:15 in the morning. Whatever it was, it was loud. 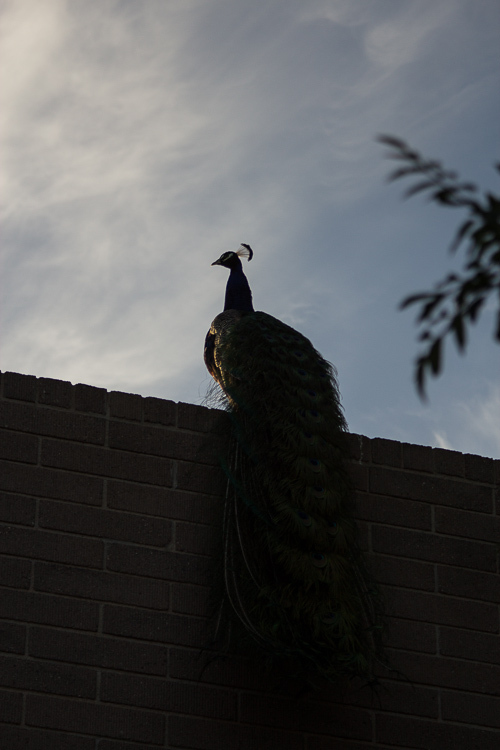 Now in the many times I have been to Sahuaro Ranch Park to take photographs, I have never been able to capture a peacock with his feathers out. But today I got lucky. This bad boy came out this morning and claimed the parking lot. 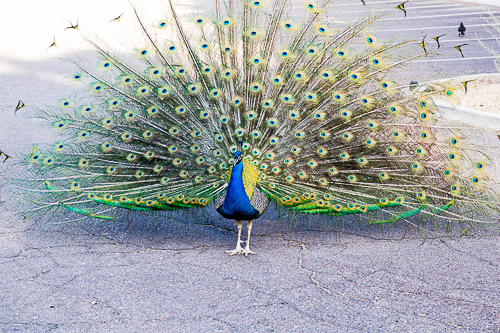 He had those feathers spread the entire time I was there, a living version of strutting like a peacock. Spent most of his time walking around and chasing any and all birds and critters that happen to land in his space. In the upper right of the picture is one of the birds the peacock was particular vexed with that morning. Since I didn’t have a long enough lens with me to catch closeup shots of this bird from the safety of my truck bed, I had to sneak up on this guy, like Elmer hunting wabbit, in order to get close enough to get a good picture. As I kept shooting and stepping closer, I started to think in the back of my mind “what if this sucker gets ticked off and attacks me?” If that bird attacked me and I wasn’t mortally wounded, I knew for a fact I would feel extremely stupid about it. 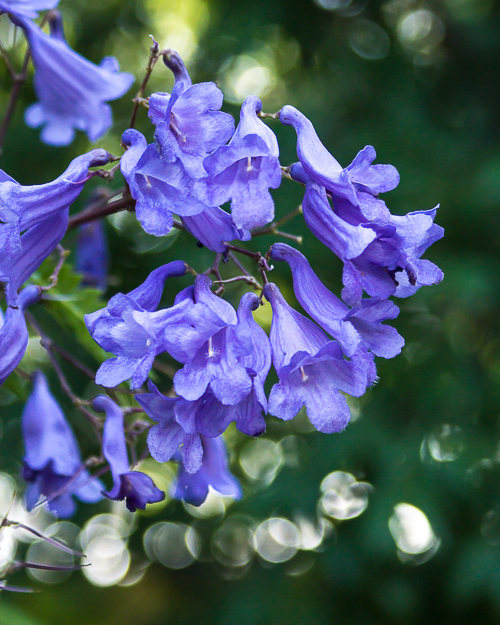 I concluded it was time to stop shooting the pretty bird and go shoot pretty flowers instead. But I apparently was not done with peacocks that day. 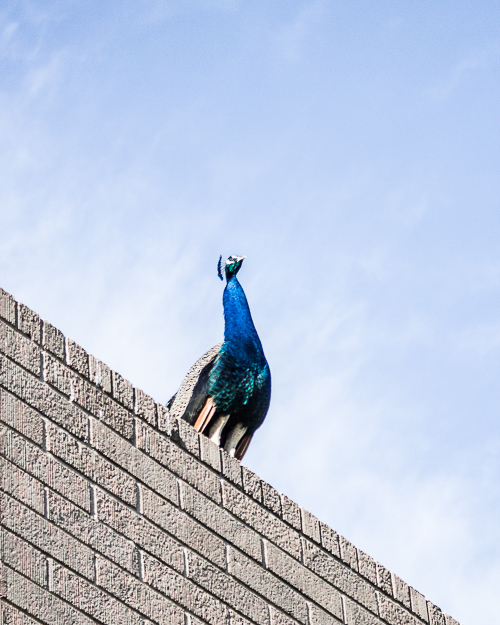 As I was going about my shooting, I heard this loud peacock cry from right above me. I looked up and there on the roof of the two story library was this fellow. 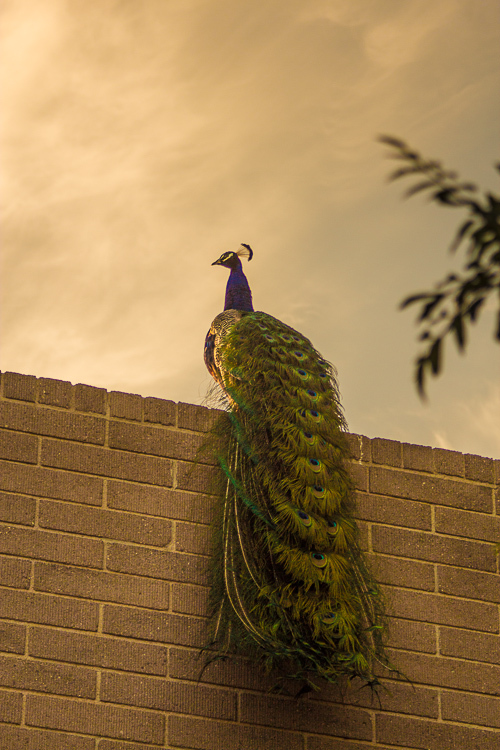 There he was, the king of all peacocks that morning. And unless there is a secret little peacock ladder, that guy had to fly up to the top of that roof. Just like I have never seen a baby pigeon (have you? 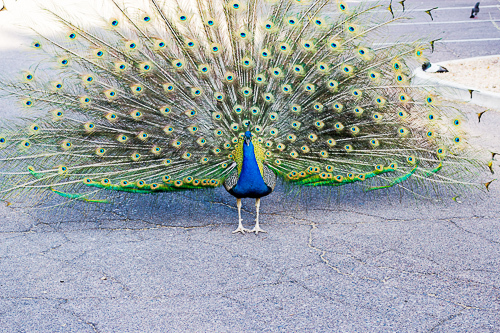 ), I have never seen a peacock fly. I still haven’t, but I bet it is a sight to see. Of course being it is really, really early in the morning and I am not coffeed up yet, my mind starts wandering off into a little flight of imagination. Having already escaped a near death situation with the peacock in the parking lot (I am never going to an outdoor shoot again without my Bowie knife). 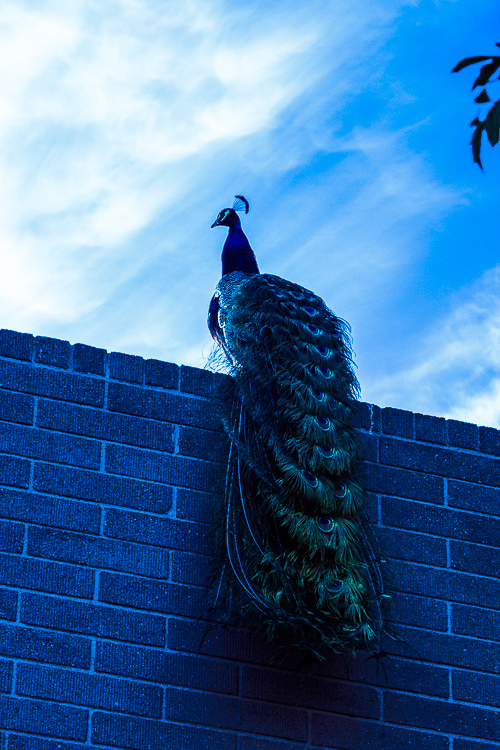 I immediately connected the peacock on the roof with my favorite scary TV episode “Pigeons from Hell”. What if they were Peacocks from Hell? Seriously, if there were about 20 peacocks lined up on that roof looking down at me, I am heading for the truck and locking the doors and leaving, Bowie Knife or not. I am not going to be the photographer who keeps taking pictures until the only thing they find is my camera and the last shot I took was of the monster’s teeth and gullet. I am not going to be the Tim that dies in this scary movie. As photographers today we are blessed, and sometimes I think cursed, with the ability to manipulate the final image into whatever reality we as artists would like that image to reside. Reminds me of another moment from a great classic move, “The Three Amigos”, in which the German was telling Ned that all his quick draw ability was just special effects. We have that option as photographers as well, to alter the reality of our photographs. So I decided to play a little with the sliders in Light Room 4 to give the photographs a bit of a different mood for each image. This is the image straight out of the camera. I tend to shoot dark, so later when I edit I don’t have a blown out sky. So let’s adjust the sliders a little to give the photograph a bit of a golden glow of the morning sun. I next tried a bit of over saturation and cooler temperature to give the photograph a bit of an other worldly look, or a twilight look. 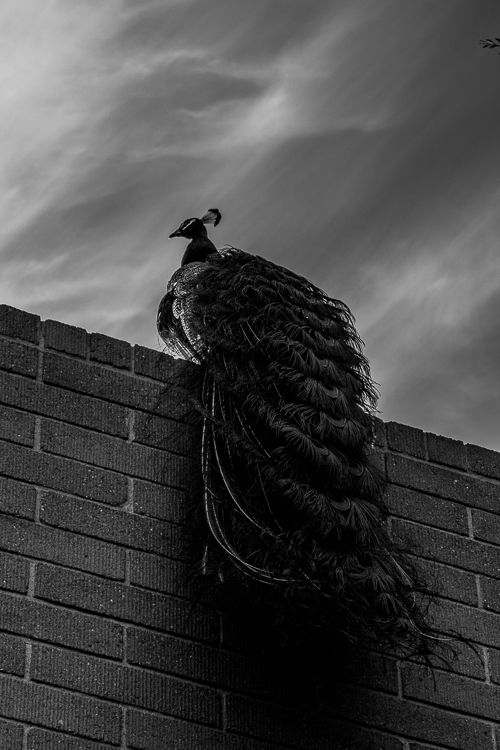 Of course, if I was continuing in the “Peacocks from Hell” meme, I would just say one thing: everything is scarier in black and white. Thank you Freda. I think you may be my number 1 fan. You are absolutely right, the Black person dies first…then they bump off any character named Tim soon after that, usually after the some girl dies.